A scheme designed to get older and vulnerable people home from hospital and living independently has been generating impressive results, according to its annual review. Lincs Independent Living Partnership (LILP) has published its first Annual Review which highlights how this consortium of local charitable organisations is helping to solve what is very much a 21st century challenge: how to keep Lincolnshire’s ageing population safe and well and prevent accident, illness and admission to hospitals and institutional care. Established in 2013, the consortium comprises Age UK Lincoln, Boston Mayflower, LACE Housing, Lincolnshire Home Independence Agency (LHIA) and St Barnabas Hospice. 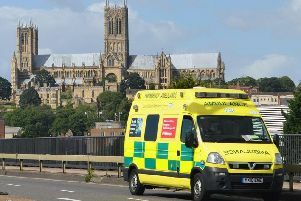 They work alongside health, care and housing commissioners to design and deliver services for vulnerable people of all ages in Lincolnshire to prevent accident, illness and hospital admission, to provide a means of early intervention for low-level need, and to support reablement after crisis. At the same time, services actively promote health and wellbeing. LILP currently delivers two services – the Wellbeing Service and Hospital Avoidance Response Team (HART) – which help local people facing illness, disability and the effects of advancing age to live safely, healthily and independently at home. Wellbeing Service assessors and caseworkers visit people in the comfort of their own homes to help identify and address any problems which are affecting or might affect health and wellbeing – for example, mobility around the home, financial problems, social isolation and/or transport. The service includes Home Safe, a supported hospital discharge and resettling service. 80% of customers met planned outcomes. An independent evaluation of the service’s first year reports that if five per cent of clients avoid one hospital stay and are able to remain in their own home for one extra year, rather than in residential care, the savings would be more than £6 million. HART provides up to 72 hours’ support at home, where hospital admission is deemed inappropriate or after hospital discharge, when responsive or planned care can either bridge a gap until longer-term arrangements are established, or provide short-term support to sustain independence. As the Annual Review indicates, the impact of HART in the first three months of operation alone has been equally impressive. From December 2015 – March 2016, HART provided a total 467 days’ support, which represents a bed-day cost saving of £170,455 (based on the cost of a bed per day at Lincoln County Hospital of £365). LILP believes that there remains vast potential for the consortium to work alongside the public sector to develop services, so that it can help even more people to maintain independent lives whilst saving even more public funds.